By law, it must be no more than half the adult fare. Which section of law are you referring to? I’m just curious to learn. Title 49 Code of Federal Regulations Part 609, applicable to projects or services receiving federal funds. “Q. Is the provision of half-price fares to senior citizens and persons with disabilities mandatory for all FTA-assisted transit services? The Access pass costs $45 per month, and is only for paratransit-qualified riders. Not sure about ACCESS but SHUTTLE monthly passes are Flash Passes (“show to driver”) valid on SHUTTLE and PT bus. Yes they are loaded on ORCA. Unfortunately access cannot accept epurse. John Slyfield has a really good point. If Access can accept ORCA, using a system in which the driver already knows if the rider has a monthly pass, and what type, (since ORCA readers aren’t actually on the Access vans) then the same system ought to be able to track e-purse, and let the driver know when the passenger has neither a pass nor e-purse left, and is expected to pay. I must warn you: This is supposition. Encouraging frequnt Access passengers get a pass takes away their incentive to be judicious with their use of this expensive service. I’ve pondered whether Access riders should get to ride all fixed routes for free, without buying a pass (at least those who do not have to be accompanied and are paratransit-qualified because they have limited circumstances in which they can’t ride fixed routes), or perhaps with just a standard RRFP, costing $18 less a month. My only qualm with that is that it will become an incentive for riders who don’t have any reason to use paratransit to become paratransit-qualified, in order to get the price break, and flood the system with frivolous applications, creating a much longer line for those who actually do need the service to get qualified. Brian, any idea how the new service will compete with the existing STEX service? 5 trains could easily handle all the loads, but departures would be pretty limited over the existing 3.5 hour span. I would expect them to keep some of the early and late runs, and run the trains on 30 min headways from about 5am-7:30. The [ST593] is slated to be cancelled according to the SIP, which has only 7 trips in the AM from 4:31 to 7:34. I think their going to have to keep a couple of those running to match the current span of service. Anyway, Sounder Rail should replace current bus service and do it for less operating cost. Any initial read on ST estimates, or your own experience? The operational cost savings from “cancelled” 593 runs is minimal, as their platform hours will be converted to 590 runs from Tacoma Dome Station. A lot of riders going from South Tacoma and Lakewood to Seattle will transfer at TDS, if for no other reason than to save up to $5 per round trip. I agree that cancelling the 593 altogether is a big span-of-service reduction for South Tacoma Station without a one-for-one replacement of Sounder trips. Seven 593 trips each way are slated to go away, so total trips will drop by two each way. There is no direct PT line between South Tacoma Station and downtown Tacoma. But then, if South Tacoma Station is mainly a park-&-ride, riders outside of the Sounder span of service will just switch to parking at Tacoma Mall or TDS. (If Metro were doing the analysis, they might treat these commute trips as if they actually began in the South Tacoma Station parking lot. ;) So, keeping 593 runs going might have to do more with counting parking stalls than thinking about span of service. The big platform-hour savings will come from eliminating several 592 runs, which has to do with ridership as much as it has to do with Sounder starting service to Lakewood. The cancelled 593 trips are slated to be turned into more 590 trips i believe. I think it was origonally ST’s intent to cancel more of the peak 59x trips when Sounder came online figuring people would take the train over the bus, however both modes have devloped their own markets and doing so would cause a severe capasity crunch on sounder these days. Currently, the ridership on the 593 portion between South Tacoma and TDS is close to nil… I really doubt the demand is there to justify “shoulder” 593 trips to match the existing span of service. Since PT routes 300 (which stops within walking distance of South Tacoma Station) and 57 are interlined, one could argue that there is direct service downtown, it just takes a ridiculously long time to get there. I don’t think it would be smart for a commuter to park their car at the Tacoma Mall — I think the mall security might have you impounded if they caught on to people doing it on a regular basis. It’s not a park-and-ride. 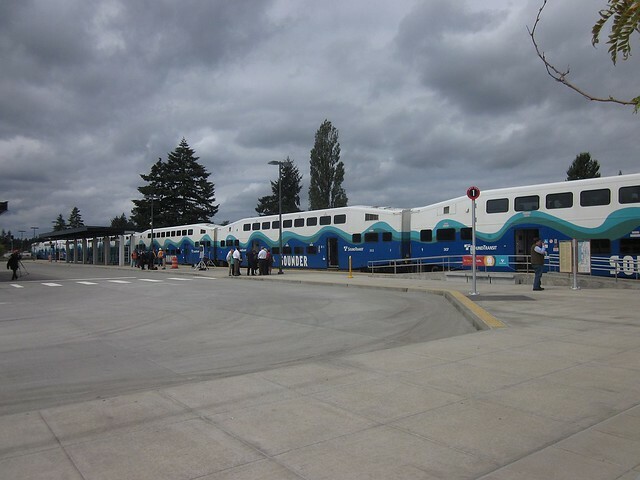 South Tacoma Station has 200 dedicated P&R stalls, so based on your observation of boardings, that should be plenty. Does that seem correc, as I don’t get down there at all? It will be intresting to see how the South Tacoma Station grows with the launch of service. Personally, i think that ST should be looking into Shoulder 593 trips for it, plus even local feeder bus service (adding a couple of trips on the 53 and 300 for example, timed to meet with the train. mabye bring back the old 59 route to serve the station, or some kind of neighborhood circulator). As for Lakewood, It might behoove both PT and ST to move the Lakewood Transit Center away from the ‘mall (or Towne Centre as they call it), and to the train station. Might save some money, elminate redundant facilitys, etc. And if thats not feasable, restructure some routes to meet the train such as the 2, 48, 51, 204, 212, 214 at Lakewood Station to provide a connection into the neighborhood. One of the things with the South line, is that the origonal stations were designed to handle the capasity of 9 trains a day, and would be big enough (so said the consultants). After 6 months with the first 2 round trips a day, Puyallup and Sumner were totally filled up. Sound Transit should be planning for this, even if funding isnt available right away. Lakewood actually has 3 TC’s currently: The Lakewood TC at the mall, the Sounder station, and the SR-512 P&R. Not all buses serve all 3, for example the Olympia and Seattle express buses skip the Lakewood TC. Though most routes that serve the SR-512 P&R also serve the Sounder station. The Lakewood Mall TC is owned by Pierce Transit, 512 P&R is owned by WSDOT, and the Sounder station is owned by Sound Transit, so I think there are various masters involved in terms of how the costs shake out. The ridership on the local PT routes in Lakewood is centered around accessing the businesses and services in the Gravelly Lake/Bridgeport core, along with the VA Hospital and Pierce College. You’re going to be in the vicinity of the current transit center anyway, or at least passing by it in order to get to the Sounder station from the west. Given the current state of the Pierce Transit budget, I don’t think adding a mile-long tail to most of the Lakewood routes is feasible. The 51 schedule should definitely be coordinated with the Sounder arrivals, however. If you eliminate the transit center and restructure the service, there will for sure be some cost savings as you have one less facility to maintain, even if you do have to put some towards lakewood station, it is still going to be less than what it will cost to maintain and secure a seperate facility. My biggest concern though more than anything increasing parking or adding additional shuttle bus services to communities to keep the ridership growing on Sounder. The lack of parking and shuttle services is Sounders big drawback right now and while Sumner and Puyallup will be addressed, that still leaves Kent and Auburn with no additional capacity when the new trains come online. While I have access to the PT 497 shuttle in Lakeland Hills, it only reaches a small part of the community and really needs to be expanded throughout the rest of Lakeland and Northlake or another shuttle added for Lake Tapps. I personally believe a station at the bottom of Lakeland Hills would be the best idea. I could probably back into a cost per train number if I knew the turnback timing. 11 minutes down, 11 minutes back, and HOW MANY layover minutes does the BNSF require at the Lakewood Station? Of course through routing would eliminate a turnback at TDS, but would they be effectively the same (tail track usage, etc)? I may just be a wash, in which case 22 minutes extra to eliminate a ton of buses would really be good. I think it’s effectively a wash.
Great news! What did Sounder finally end up costing? That’s not really the end numbers though since there are still some capital projects to be done. The original plan was to cost $669 M. and have 14 stations. We’ll end up with 10 stations in 16+ years for a total of about $1.5 B, so maybe twice as much when YOE $$ are figured in. The big winner here was BNSF on trackage rights. Lower cost per rider? Not so much. On that “lower cost per rider” figure, are you talking about commuters between Tacoma and Seattle, or about commuters between Puyallup, Sumner, etc, and Seattle? Since Sounder isn’t primarily a Tacoma-Seattle express, do you have a grasp on the latter comparison? Let’s leave the sky-high figures on North Sounder out of it when figuring out whether South Sounder was worth it. Not really. Purchased Cost per boarding for S.Sounder was $12.25 last report, but parsing that out to individual station pairs would be a shot in the dark without the data. It’s fair to say the Lakewood riders will cost substantially more than say a Kent rider going to Seattle, with the average being somewhere around 12 bucks. If anyone wants to see the proposed schedule for Lakewood trains, look at ST SIP 2012, pg.28. There is also the matter of marginal cost per boarding. What does ST consider the capacity of a Sounder train, and how close are they to being full? How long can a Sounder train be? What is the cost of an extra Sounder passenger car? How much do they have to pay BN&SF to add an extra daily run? This is not so much about whether Sounder was worth it, but whether ST is getting its best deal out of Sounder, and whether the cost of new counter-peak and off-peak runs would be better spent on additional peak-direction runs. Keep in mind that offering an off-peak or reverse direction run means reusing a trainset you already have. Operating an additional peak run means you have to either have to deadhead an existing train in the reverse direction or buy a whole new trainset to operate just one trip per day. If the latter, you also may need to build additional storage track in Tacoma, and to avoiding deadheading the train a full round trip each day, you’d need an additional storage track in SODO as well. I’m assuming that the reason the reverse trips exist today, in spite of their minimal ridership is that running the train in the reverse direction in preparation for another peak trip is still cheaper than buying a whole new train for that extra peak trip. And since the marginal cost of having the train in service vs. deadheading is so low, what few passengers the line does get is treated as bonus. I’m not sure if it’s worth looking into the rear view mirror too often on Commuter Rail or even Link is worth the time, as the capital investment is now a sunk cost. It certainly should be considered when deciding if further extensions on a particular mode is truly cost effective. I wouldn’t want to add another extension to say ‘Pettycoat Junction’ for a few riders, knowing BNSF is getting about $50 mil for each additional trip added along the corridor for trackage rights. If you ignore those costs, which are paid in real dollars, then sure, the extra few minutes for Ma & Paw Kettle and the Kids may actually pencil out as not such a bad deal. How many cab rides, door to door, could you purchase for the same investment? While I would generally consider the Sounder extension to Lakewood questionable, the economics isn’t nearly as bad when you consider that Amtrak will eventually be able to piggypack off the investment. However, I still say, if you want the train between Seattle and Tacoma to make sense financially, the train needs to be the way to get between Seattle and Tacoma during the peak period in the peak direction, and ST should not be spending gobs of money on single-direction-peak-only buses to merely compete with itself. I’m all for Seattle->Tacoma buses to handle off-peak or reverse-direction trips during periods when the Sounder train isn’t running, but to have buses and trains making the same trip at the same time seems very wasteful. I forgot to mention – I would be curious if passengers would be willing to pay the extra $2 to take the train over the ST Express. Given that the marginal cost of accomodating one extra passenger on the Sounder train is essentially zero, the bus and the train should have the same fare. If the removal of the fare incentive to ride the bus over the train means not enough people ride the bus, then get rid of the bus. +1! I’m not a fan of distance-based fares for local, scoliated milk runs, but since ST Express doesn’t have any, setting up distance-based fares based on stop pairings is very doable. But set the pairings so that anyone getting off in downtown Seattle is paying the same maximum fare based on the starting point and there is no reason to tap off in the Central Business District. And compute the distance as the crow flies between the start and end, so that someone riding Sounder pays the same as someone riding the express bus between the same points. I don’t see too many takers on riding Sounder the whole way from Lakewood when the round-trip costs $4 more, or $72 more per month. It does indeed seem crazy for the ST Express bus to be *cheaper* than the Sounder train, given that it is more expensive to operate *and* faster. ST Express from Seattle to Tacoma should cost either the same amount as Sounder from Seattle to Tacoma, or slightly more. I have always hoped Sounder would evolve into less a commuter and more an all-day transportation service. If an off-peak run does happens (which I’m REALLY excited about), that will signify the start of a more complete rail option between Seattle and Tacoma and points in between. I was on the very first afternoon reverse run from Tacoma back to Seattle. On that day there were only two in my car (the other rider got off in Puyallup) and perhaps twenty on the whole train. Times have certainly changed. I hope to be on the first revenue train to Lakewood, but will have to take the bus back to Seattle. I can live with that–for now. Perhaps one day we can get to Monroe or Marysville if ST taxing district is enlarged. Perhaps someday Monroe and Marysville commuters can take Sounder to Seattle, but even taking Sounder to Everett (or Lakewood, for that matter) for the day doesn’t seem to be on the event horizon. What would be more realistic is for ST to negotiate an enlarged Rail Plus deal with Amtrak. The problem with expanding sounder beyond its current boundaries (except dupont) is the boundaries of sound transit. This is also the issue with expanding rail plus. expanding either requires expanding the boundaries. Then why is the 595 allowed to leave the boundaries? RailPlus has the problem that the Amtrak schedules are generally not aligned with approaching Seattle during the peak commuting times, and that the actual arrival time of the train relative to the schedule is too unpredictable (remember, the train has come from a long way to get to Seattle). This is especially true for the Empire Builder. While one could imagine a station in Monroe that carries commuters under the RailPlus program, remember that you’re talking about a train whole “reliability” is such that 95% of the time, it pulls into Seattle sometime during the 2-hour window between 10 and 12 each morning. While this is generally good enough if you’re doing a vacation trip from Chicago or Montana, a system like this is virtually unusable for commuters who are only going as far as Monroe. I am hoping for Stanwood to the North and Olympia to the South but more realistic would be Marysville and Dupont. The first PM reverse train out of Tacoma arrives at KSS a few minutes before the last Everett train leaves north. Not sure if that’s what you mean by meshing. If so, it may be the only one which does–I haven’t looked at the schedule. Perhaps there wouldn’t be much call for Tacoma passengers going all the way to Everett and vice versa. A couple of years ago, ST’s rider news featured a story about someone that commuted between Mukilteo and Kent using a reverse-peak trip. I’m not sure if the schedules still allow that. There is a layover of six minutes between the southbound 1701 and the southbound 1503 in the morning. Northbound, there are several combinations that work. There’s ONE southbound train from Everett that will allow you to transfer to Tacoma and ONE northbound back. The problem is the PT 603/605 don’t even remotely mesh with the Sounder so there’s no chance of using the Sounder in a trip from Olympia to Everett. This is unfortunate. The 603/605 is operated by Intercity Transit, IIRC. The connection, at least per the SIP, will end, unless that schedule has been modified to retain those connections. The north Sounder line suffers a major problem in that the line between Everett and Seattle is more circuitous (and therefore slower) compared to the 510 taking a straight shot down I-5. So we’re spending a ton of money to provide a service who’s primary market is people who are willing to trade a few extra minute of commuting time for a smoother ride and nicer scenery. For Edmonds and Mukilteo, the Sounder does offer the fastest service to downtown, but those stations are more out of the way than Everett and, therefore, get much fewer riders. When Link is extended to Lynnwood, the north Sounder gets even more ridiculous, as people who drive to Edmonds or Multilteo station today will likely get to work faster by driving to Lynnwood TC and catching Link instead. And for people making ferry connections, a non-stop shuttle to Lynnwood TC, timed to align with ferry schedules, would get people to work faster than waiting up to 30 minutes for the Sounder, and would be far cheaper as well. I find it absolutely crazy that ST’s own long-range plans call for the north Sounder to continue to operate indefinitely while Link is extended to Lynnwood, which is tantamount to ST spending billions to dollars to compete with itself. What we should be doing instead is a major shuffling around of its fleet. Take the trainsets that, today, are used to operate the north Sounder, and use them for the south Sounder. We can use them for either longer trains on existing trips or the creation of new peak trips. Then, take some of buses that do peak-period Tacoma->Seattle trips which are made unnecessary by the additional Sounder capacity, and deploy them up north to operate additional peak-period 510 and 511 trips to absorb the people who used to ride the Sounder. For ferry connections, add a peak-period nonstop shuttle from Edmonds and Mulkilteo to Lynnwood TC to connect with the 511 (and eventually Link). To prevent overcrowding on the remaining buses that go Tacoma->Seattle during the peak, change the fare schedules so that price incentive to ride the bus over the train goes away (in fact, maybe the train should even be a little cheaper). I would love for Sounder to come to DuPont. If I remember correctly, that was the reason DuPont Station was built next to that rail line: so that it is rail ready should Sounder be extended. I can easily see Intercity Transit buses coming into DuPont to meet Sounder should that ever happen. I think ST does have track rights to run trains to the Thurston county line via DuPont, could someone verify? Given that Gig Harbor pays for ST Express 595 to leave the ST district (and I suspect does not pay the full cost), Thurston County could certainly consider paying to have Sounder reach the Olympia area without having to vote to join the ST District. Heck, the state ought to pay for Sounder to do that during session. It’s far cheaper than making I-5 extra wide between Olympia and Tacoma, and the resulting speed-up of freight trains would have excellent residual effects for the state economy. Pierce Transit actually pays for the 595 to reach Gig Harbor. Sound Transit owns the whole line, and when WSDOT makes improvements to it for the Amtrak Cascades it might be come cost effective to run sounder down there as well. Of course i dont think you could get Thurston County to pay for it’s extension, since DuPont is still technically in the RTA bounderies. I believe ST funds are used on the 595 between Seattle and the Narrows Park & Ride (last stop before it crosses the Narrows Bridge), then from there, PT funding takes over. The 595 has the highest cost-per-rider of all ST Express routes, with most of those riders living outside the ST taxing district. This strikes me as wrong. If ST is paying from the district boundary, maybe it is time to play hardball. ST should offer to pay to get these passengers as far as Tacoma Dome Station, and no further. Then, the standing rule doesn’t have to be so strict, so fewer runs are required. Some riders from Gig Harbor might be pleased to have express service to downtown Tacoma, instead of having to transfer at Tacoma Community College. If Pierce Transit wants to pay the cost of five express trips for Gig Harborites to downtown Seattle, be my guest. If PT doesn’t want to do it, then Gig Harbor can come up with the money. As an ST taxpayer, I have to cry foul. The one time I took the 595, it was *PACKED* by the time it got me at 2nd & Washington. I rode to the Kimball Drive Park & Ride and that is where the majority of the riders got off. There were a couple that got off at TCC and a couple that got on, but for the most part: these passengers wanted to go from Seattle to Gig Harbor. I’m glad 595 gets utilized. I just want the governmental entities from where they reside paying the cost of that route. Gig Harbor can afford it. ST needs to take care of the riders from its own taxing district. ST’s reason for dropping the DuPont Station in ST2 was that the main beneficiaries would be people living outside the taxing district. Thurston County residents would pick up the train in DuPont, but not the cost of construction. Perhaps Thurston County can fund Sounder service all the way to Olympia someday, even without joining the RTA taxing district. Trains could run local OLY-TAC, then express to Seattle during rush hour. If they build a flyover at the BNSF mainline at Nisqually, service to Tacoma could run all day without conflicting with freight traffic on the mainline. This would be far more affordable than endlessly widenIng I-5. DuPont, Lakrwood, Lacey, and Olympia would all benefit greatly. A Tilicum station would revitize that community, and serve military centers at Camp Murray, Fort Lewis, and Madigan Army Medical Center. Oops: The 595 is only second-highest in cost per boarding, well behind the 592. The 592 also performs poorly in boardings per run, unlike the 595. Hopefully, the 592 frequency reduction will address both with minimal lost ridership. Also, over a quarter of boardings on the 595 appear to be from Tacoma Community College, during AM peak. But that still leaves ST taxpayers heavily subsidizing long commutes by Gig Harborites who do not live in the ST district. Keep in mind that the 595 is a vestige of the pre-Sound Transit days when the 590 series was created and funded by Pierce Transit. Several years ago, Pierce Transit’s long-range planning included supplementing the 595 schedule with trips funded entirely locally, calling it Route 195. The stats on the 595 show that about 40 percent of the boardings come from the two Tacoma stops, which are within the ST district. It would be interesting to the specific ratio on how the funding on the 595 breaks down (I have never seen it presented in either Pierce Transit or Sound Transit documents). My guess is that its impact is proportionally greater on the PT local service budget (though the dollar amount may be less), but it has been “held harmless” during PT’s rounds of cuts. I have always thought that it may be cheaper and perhaps a bit faster for Pierce and/or Kitsap Transit to just provide the Purdy riders an express bus to the Bremerton ferry. Not only would you serve Seattle commuters, I think you’d get a sizable group of Bremerton shipyard workers too. While the car ferry is too slow, and has way too long headway to do this, the Kitsap Foot Ferry is proving to be quite popular. There would be capital costs in getting additional foot ferries, but I bet this would pencil out and drive ridership. Plus, it would complete a missing link between Pierce and Kitsap Transit, making it possible to circumnavigate Bremerton, Seattle, and Tacoma by transit. What time will the off-peak train leave each terminus. That information wasn’t available in the SIP. I would gather it would be between 11am and 1pm though. Why will the trains run at 60 mph, rather than 79mph. Also, will trains always run at just 10mph south of lakewood? What will this do to the cascades trains? WSDOT’s Point Defiance bypass project will improve the tracks south of Lakewood. Context. Former posts. History. Check before you type. That is the speed limit deemed safe by the cities and the STB… among other companies… When the bypass is completed, it will be 79mph from South of South Tacoma Station to Nisqually for Amtrak only. The extra fuel costs required to accelerate Sounder trains up to 79mph do not justify the very minimal running time reductions that would result (something on the order of less than a minute difference). That, and between Tacoma Dome and South Tacoma there are sharp curves and grades. This is great…now South of Tacoma residents have a fast way to get to the Tacoma Dome to see NBA and NHL games! Also, I love that station. It shows just how little is needed to get set up with an existing rail corridor! Pure simplicity. Sounder succeeds in uniting the 1st and 3rd largest cities in Washington State. I think, Olympia is just 30 miles, and at 60 mph, 30 minutes, from downtown Tacoma. And Centralia, in the center of the Western corridor is just another 30 miles. So you can have your home in the country and commute in to at least Tacoma at a reasonable speed. The center of population has gradually been shifting downstate to the Oly area anyway. Thought: Could Tacoma someday out grow Seattle? You know at one point it was slated to be the biggest city…but shady dealing put the railroad terminus in Seattle. The whole era was shady, Tacoma as well as Seattle. “Sounder succeeds in uniting the 1st and 3rd largest cities in Washington State”: great delusion, or the greatest delusion? Almost as good a photo op as driving a tank while running for President. Hope it works out for him. Why single track on the bridge in Tacoma over Pacific Ave? Whats the latest on Point Defiance Bypass? I’m hearing conflicting things about when it will be completed, 2016? or 2018? Has there been any serious talk of extending Sounder into Downtown Olympia by reactivating that old spur? I realize its in its own territory/country/taxing district/agency but seems somewhat logical given Olympia, by its location if served by rail, has to be on a terminating spur which works well with Sounder coming from the north/east. Olympia is also a rather significant employment center. ST didn’t have funds to construct and maintain a double-track bridge when they would only utilize one track. The second track from TR Jct. to 66th Street will be constructed by WSDOT in the final phases of the full PNWRC build-out. The physical layout of the route is designed to allow two tracks from Tacoma Dome all the way to Nisqually, if I’m not mistaken. But two tracks are not necessary for the initial service, and it saved a lot of money to only build one to start with. They can always build a second one when train frequencies get high enough that they need it. Before they do that they are expected to need a second track east of Tacoma Dome, however.